Okay, I love my RPG games. The games that I play from Playstation 1 to Playstation 2 to my PSP are RPG games. 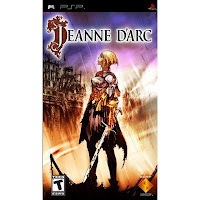 Anyways, when I was looking into any good RPG games for the PSP I've come across Jeanne D'Arc review over at gamespot and it has good reviews so naturally, I bought it. 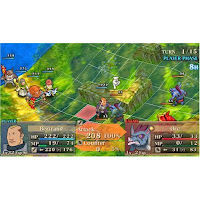 I was expecting your traditional RPG game, more on the Final Fantasy Side like Brave Story New Traveler, well Jeanne D'Arc isn't the traditional RPG game series. Sure, I know that it's supposed to be strategic since you have to move your characters by using limited game tiles and moves but I was actually looking forward to this gameplay since I used to play something of that sort on an SNES game system but I forgot what game title that was since that was like two decades ago. In Jeanne D'Arc, you're limited to controlling your characters only in battle mode. You don't get to explore anything, you don't open chests, you don't talk to townspeople, you don't get a world map where you explore and fight monsters. You can, however, buy weapons and potions (thank goodness for that), and you can level up your characters by fighting monsters in free stage but that's it. Jeanne D'Arc also offers some sort of a side game where you can bind skills but even that gets boring. I'm not kidding on this but Jeanne D'Arc actually puts me to sleep. SERIOUSLY! This is a good game to fight off my insomnia coz halfway through battle I could feel my eyelids getting heavy and I have to do a quicksave. Plus, I don't know if it's just my superior brain power or what but the "strategic gameplay" didn't even make my brows sweat. The game graphics are good and you will get entertained by some sort of anime clips every so often. All in all, if you're looking for an RPG game that's more in line with Final Fantasy, this game will be a big disappointment but if you're looking for strategic RPG games, you'll like Jeanne D'Arc. I'm into traditional RPG games so I have to give this one a 3 out of 5 stars. I understand that strategy RPGs are not your kind of game, but Jeanne D'Arc is actually very accessible and not very complex as far as strategy games go. But I guess the pacing's not for you. But if you want to try a strategy RPG with more personality, give Disgaea a try. Thanks for the recommendation. Will definitely check it out. Right now I'm trying to finish Riviera but I have very limited time so I'm still not able to finish that game. Will try to buy that game next time.